Tangorang Labs is a small team of semi-domesticated orangutans dedicated to spreading the fun through original and innovative mobile apps for the iPhone and iPad. From the rain-glistened evergreen forests of the Pacific Northwest, Tangorang Labs aspires to reach mobile apps users of every age, background and persuasion. A very fun way to learn the ABC's! Featuring 26 whimsical illustrations, letter tracing and full narration, this is the ultimate alphabet app. Coming soon to the iPad, iPhone and iPod Touch. Celebrate Thanksgiving with Word Spree! 15 Thanksgiving themed stories will keep you and your family laughing throughout the long holiday weekend. Also available for free in a lite edition. 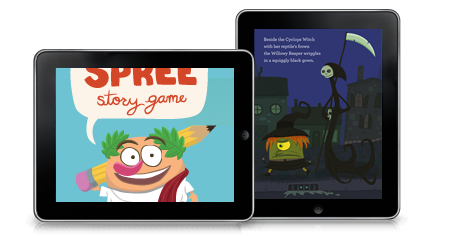 Find out what happens when the Prune-Skinned Goon, the Cyclops Witch and other ghoulish characters slink out from the forest and into the sleeping town of Hazy Dell in the Tangorang Labs interactive storybook app It’s Witching Hour in Hazy Dell! Word Spree is a story game in which your words are set free to inhabit a wonderfully random story that you never saw coming. Share your favorite Word Spree creations with friends via Facebook, Twitter or email. We'd love to hear from you! Let us know if you have ideas about how to make our products better. Also, email us if you just want to say "hi." Possibly you just saw something remarkable happen and you're dying to tell someone about it. We would love to hear about what happened and respond with the appropriate amount of disbelief.